Everyone loves a good photobomb. The things that end up in photos that aren't supposed to be there are ridiculously amusing. Unless, of course, it's your photo being bombed, then it may really affect your ability to preserve a valuable memory. Whether it was a wedding day, a prom photo, a family trip to the beach, or the annual Christmas card, this list will give you just about every bomb you could ever imagine. 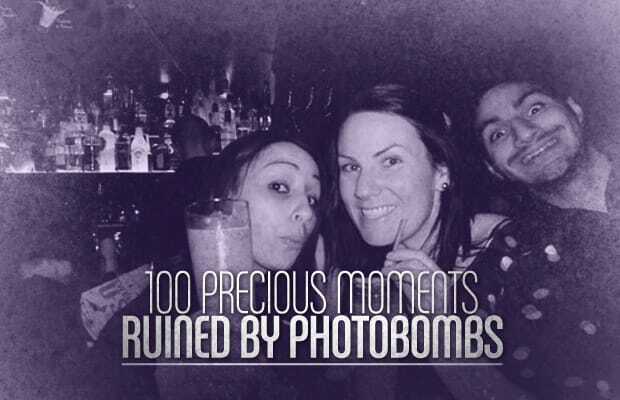 From creepy-looking clowns to interrupted make outs and grandmas throwing up the peace sign, this list of 100 Precious Moments Ruined by Photobombs has just about all of your bombing needs covered. If one of your special memories was ruined at the expense of our entertainment, we are truly sorry.